Some mornings just seem to call for fresh baked muffins. In just 45 minutes, we were enjoying steaming cups of coffee with these muffins which are chock full of grated carrots and pears, nuts and raisins. 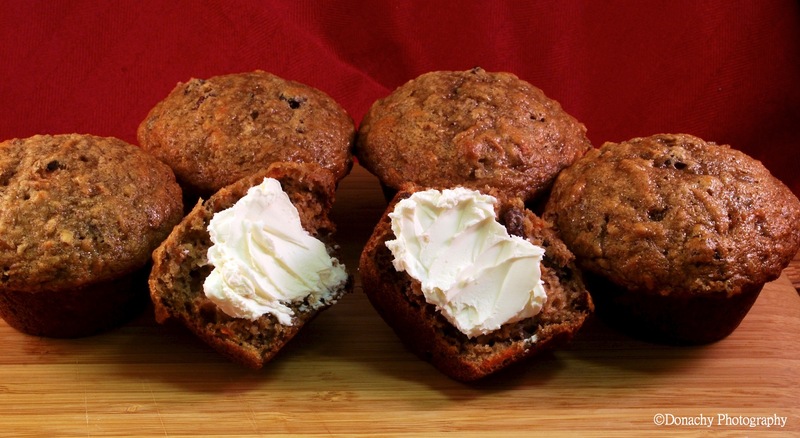 We love these muffins smeared with cream cheese. All the healthy ingredients make me feel like I’ve had a dose of sunshine–a great feeling on a morning when it’s negative 9 degrees outside and we still have eleven days to go until we see the sunrise. The recipe below can be easily modified based on what’s in the kitchen. In a large bowl, mix together flour, sugar, baking soda, cinnamon, and salt. Stir in the carrot, raisins, nuts, and shredded pear. In a separate bowl, beat together eggs, applesauce, mashed banana, and vanilla. Stir egg mixture into the carrot/flour mixture, just until moistened. Scoop batter into prepared muffin cups. Bake in preheated oven for 25 minutes, until a wooden toothpick inserted into center of a muffin comes out clean. We made these for dessert tonight and, boy were they great!! We whipped up some cream cheese icing and it was like having mini-carrot cakes 🙂 Our tummies thank you! Cream cheese icing would be perfect. We ate some more for breakfast today. They are still moist and delicious!